I began full of vigor. Never mind that I’d never taken a painting workshop before. (Never mind that I’m not a painter!) Here was an opportunity to try something new, to feel adventurous, to seize the day! I had my canvas tote packed with soft paint brushes, untainted watercolors, a new watercolor pad full of promise – even snacks! Oh yes, I was prepared for a bold, new experience. Carpe diem! As you may recall, I like to foster my fantasies about being an artist. So after the instructor (who I happen to know) encouraged me to take his two-day Plein Air Painting Workshop at Saguaro Lake Ranch (I also happen to know the family who manages the Ranch, one of my favorite places locally) I decided to go for it. Did I mention I’m not an artist? Well, you’ll want to take note of that. I went right for the crown jewel of Saguaro Lake Ranch. I chose a scene with the famous ridge mountain (yeah, okay, I don’t know the actual name of said mountain), framed by a sweeping mesquite tree and rustic fence line. Praise the gods I decided to leave out the horses. The beginning stage went well. Frame out the underpainting with a quick sketch and wash of color. Blues, greens, and browns filled the paper with ease. This isn’t going too badly. I started to add detail: the black, twisted trunk of the mesquite tree; a few more shades of greens and yellows in the foliage to add interest. I kinda liked it. Then came the hay bales.They weren’t coming out quite right. I decided to come back to it. I painted in the fence. Looked a bit, um, juvenile (even more so than the rest of this amateur’s painting). That’s okay. I’d fix it with some highlights later. Then came the mountain. Such a beautiful, peace-inspiring mountain. Unless you’re trying to paint it. Then it becomes the bane of your existence, the blob of lifeless brown on your formerly pristine watercolor paper. The instructor came over to check on me. He liked the tree too. He gave me some guidance regarding the mountain. At first he wanted to demonstrate right on my painting! Oh no. This was my painting. So he humored his inexperienced, A-type personality of a student and demonstrated on a spare piece of paper. I marveled at his technique, tried to retain what he’d said and done, and went back to work. Those mountains were still a mess. This time, when the instructor came to have a look, I gladly handed over my brush and painting. He completed one section of the mountain, explaining as he went, and I tried to duplicate it elsewhere. It wasn’t great, but I learned something and had a better concept of what I could try. He reminded me why I was there. Here was a man full of adventure. I want my own adventures too. After lunch we hauled our stuff down to the river and selected new scenes to paint, this time sheltered by the shade of the trees lining the banks. Having learned my lesson, I switched from a broad landscape to a smaller-scale water study. Again, the drawing and under colors went on easily. This felt familiar and I didn’t take as much confidence from it this time around. I painted in the rocks and a few reeds and decided I needed to darken the water. Big mistake. One bold stroke and it was way too dark. When I saw what I’d done, I didn’t know how to fix it. I was desperate for the instructor to come save me. In due order, he did. He didn’t think it was a mistake at all, and carried the color through the central section. 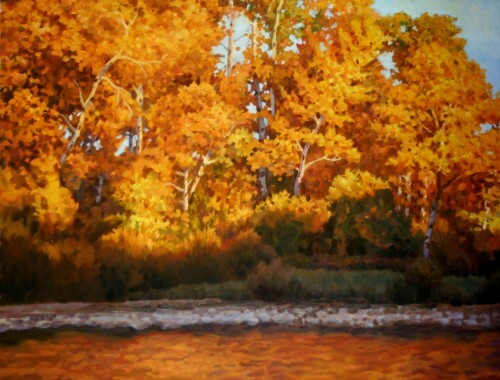 He gave me courage to be bold and add movement and color to the water, along with how to paint the reeds on the bank. I was resisting the urge to say “Don’t you just want to finish it for me?” After all, he was doing such a good job. But I didn’t say it and he left me, alone with my painting. I guess I’d have to finish it myself. I sat down on a rock to get my brain back in the game. After a few quiet moments, I studied my painting from afar. I looked at the river and reminded myself what I originally liked about the scene I chose. Despite my lack of developed skills, I still really wanted to try to capture what I saw. I thought about what the instructor taught me. I focused on a corner of the painting and decided I could try to add a group of reeds there. I can do that much. So I did. And it was fun. I moved to the other side of the painting and added more reeds. I liked the top, but didn’t know what to do with the bottom. Some grass perhaps? That was when I discovered (shock) that I don’t know how to paint grass. I abandoned the blob – I mean grass – for the thing I knew. I pulled my leather journal and pen from my canvas bag, returned to the rock, and began writing about my day. Ahhh. What a relief! Maybe the instructor wouldn’t notice. I got away with my truancy for a good 15 minutes before he came back, declared his pleasure at my improvement, said “It’s starting to look like a painting now,” and made me trade in my pen for a brush. He turned my blob into grass and I decided the painting looked good just how it was. No further tinkering required from this girl! He saw I was done – mentally at least – laughed, and dismissed me to my rock. I sat for awhile, listening to the instructor talking quietly with Navy Charlie. The river was flowing soft that day, gently soothing away any agitation I’d felt. My little alcove under the shade of the trees shielded me from any thought of the outside world. The painting called to me.